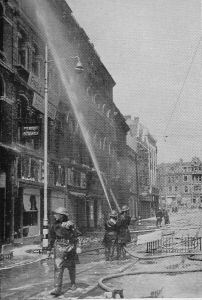 Old Town Street ran northwards from the eastern end of Bedford Street, opposite Saint Andrew's Church, to the junction with Duke Street, after which became Tavistock Road. 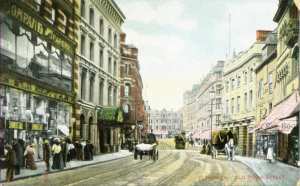 The part from Old Town Gate to Tavistock Road was formerly known as Tavistock Street. What later became Old Town Street was shown as simply "Old Town" on Benjamin Donn's plan of 1765 (below). 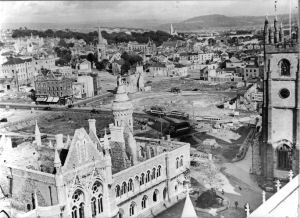 It has always been claimed that the name is derived from the fact that the centre of the Town of Plymouth, where it held it's markets, was the area around Saint Andrew's Church. 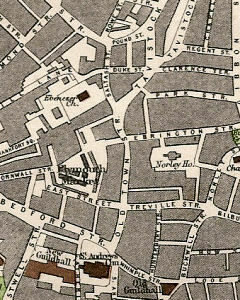 The Shambles, or Market, is shown in the middle of the Street and is clearly named as such on Richard Cowl's 1778 Map of Plymouth. 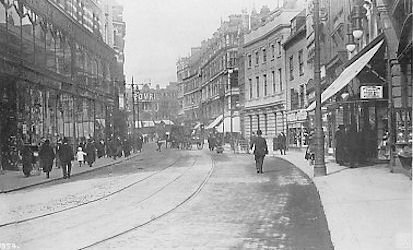 Old Town Street looking northwards towards Drake's Circus. Extract from Benjamin Donn's Plan of the Town and Citadel of Plymouth, 1765. As Donn's plan of Plymouth in 1765 shows, Old Town lead northwards from Saint Andrew's Church to the Old Town Gate, outside of which, at the \Old Town Conduit, the road split into routes to Saltash and Tavistock. 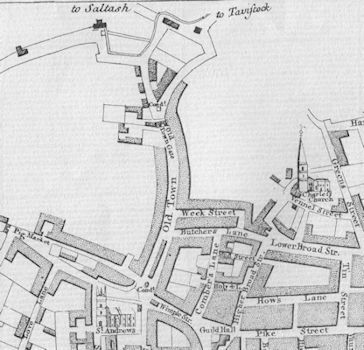 Although shown as just Old Town on Cooke's map of 1820 it was already listed as Old Town Street in 1812. Tavistock Street was listed separately. The area outside the Gate was known as Old Town Without. The section between the junctions with Treville Street and Saltash Street was the boundary between the parishes of Saint Andrew's and Charles. Older residents will recall that traffic in Old Town Street was one-way in a northerly direction between the junction with Old Town Avenue and Tavistock Road. This was apparently introduced during 1926 as it was mention in the report of the introduction of Plymouth's second one-way street in January 1927. 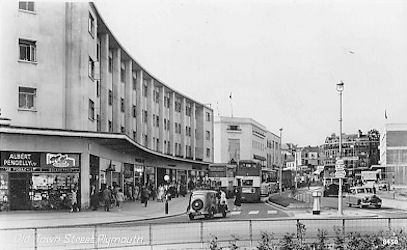 Plymouth's first set of traffic lights was installed at the junction with Treville Street in September 1929. Plans were announced on March 16th 1936 for new frontages to the properties on the eastern side of the Street. 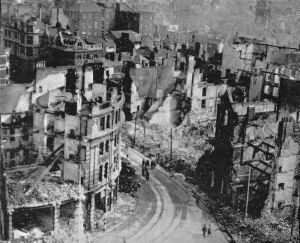 The section of Old Town Street between Old Town Avenue and Saint Andrew's Cross was flattened by high explosive bombs and incendiaries during the night air raid of Thursday March 20th/Friday March 21st 1941. Old Town Street was rebuilt in the 1950s, when it was still on the main route to Tavistock. 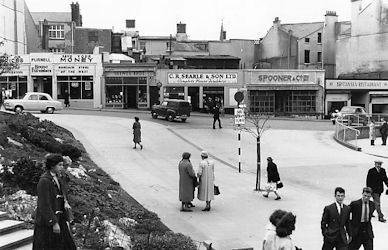 Following the demolition of Drake Circus in the 1970s, it was largely lost beneath the shopping development. 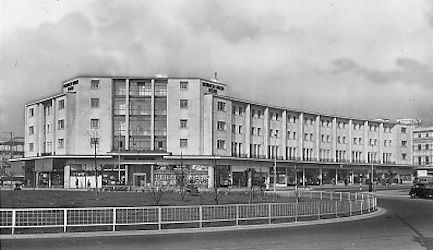 Today only the southern end survives, from Norwich Union House, pictured below, up as far as Boot's the chemist, where it now enters the new Drake Circus Shopping Mall. seen from the far side of Saint Andrew's Roundabout. Looking north from Saint Andrew's Roundabout along Old Town Street. Note that the eastern side is only partially developed. © City of Plymouth Museum and Art Gallery. For a list of the occupants of Old Town Street in 1852 CLICK HERE.